Sustainable Fuel Register (SFR) co-founders, Kevin Lindegaard of Crops for Energy and Jon Swain of FEC Energy, attended the inaugural meeting of the Renewable Heat Incentive (RHI) Industry Forum last week. 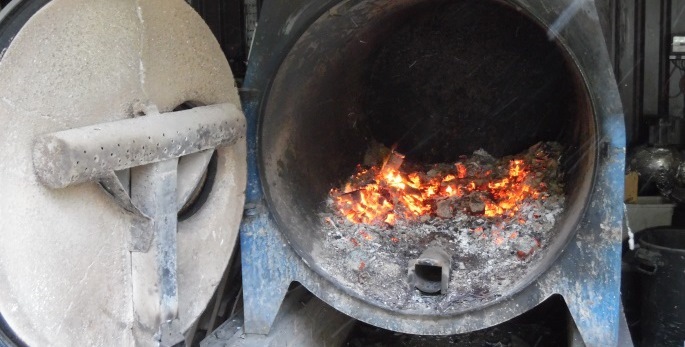 This is a new initiative, coordinated by Ofgem, enabling industry bodies to provide feedback on procedures and documents associated with the delivery of the Domestic and Non-Domestic RHI schemes. This will help ensure that documents are designed with the needs of applicants and participants in mind. The long anticipated RHI regulations are to come into effect on 20 September. The reforms were laid before parliament yesterday giving the minimum 20 day notice. This has the greatest impact for biomass boilers where the tariffs for small, medium and large biomass will all align to one new tariff. There will also be a change in the Tier 1 load factor which will increase from 15% to 35%, meaning that boilers can run for 3066 hours instead of 1314 hours before reaching the threshold. The Renewable Heat Incentive reforms that were originally laid before parliament and then withdrawn in mid-March have not yet been re-laid and latest news suggests that this may not be until after the summer recess. So far, it’s shaping up to be an unpredictable summer. The political landscape has altered somewhat from what we have been used to, the weather can’t seem to make up its mind what to do, the grid electricity carbon emissions have fallen to their lowest ever level and on top of all this off, we still don’t know when the RHI regulation reforms will be made law. The Department of BEIS has just announced RHI degressions, effective from 1st July 2017, for biomass, biomethane and biogas. 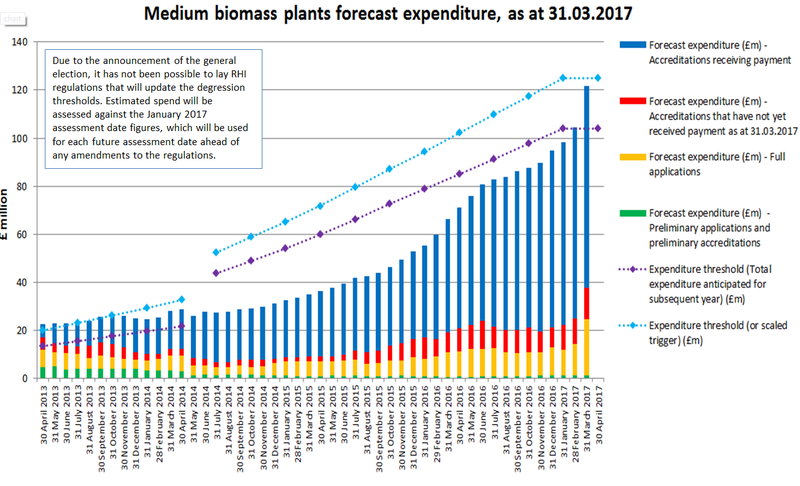 As expected, the tariff for medium sized biomass has been reduced by 10%. The forecast shows that this technology has exceeded its budget and, as the whole scheme is already over budget, a 10% reduction has been applied. BEIS has confirmed that the RHI regulatory reforms were not laid before Parliament and that the scheme will continue in its current form for now. This means that the 1st July 2017 degression assessment will be based on the January 2017 budget figures. We have received an update on the reforms from Renewable Energy Association in light of the general election announcement. BEIS aims to lay emergency legislation before parliament to extend degression trigger lines and update Microgeneration Certification Scheme standards on heat pumps. They want to do this prior to parliament being dissolved on 3rd May so that it can take effect before the next degression announcement at the end of May. The Renewable Energy Association has just announced that the Non-Domestic Renewable Heat Incentive regulatory reforms have been withdrawn from parliament due to technical issues. The reforms are expected to be re-laid before parliament as soon as possible, after the Easter recess. Parliamentary process is still anticipated to take 6-8 weeks from when the reforms are re-laid. The Wood Heat Association (WHA) has just confirmed that the Renewable Heat Incentive Reforms have now been laid before parliament. The parliamentary process is likely to take 6-8 weeks, and the regulations will come into force one day after approval has been granted. Participants and applicants of the Non-Domestic scheme can expect the scheme to continue its current format until the new regulations come into effect. For more information about the reforms, see our previous blog. Yesterday’s announcement of the outcomes of the RHI consultation has delivered some clarity on the intentions to continue supporting biomass boilers and biomass CHP. The SFR system is live. Register your fuel, find out more about SFR or get in touch to be listed on our Trade Directory of energy consultants, boiler suppliers and installers. © Copyright 2019 Sustainable Fuel Register.